Palestinian negotiators called off a planned round of peace talks today after Israeli soldiers killed three protesters during clashes following an arrest raid in the West Bank, officials said. The violence, the deadliest incident in the area in years, dealt a new blow to U.S-led peace efforts, which resumed late last month after a nearly five-year break. Palestinian officials have accused the Israelis of stonewalling and using the process as a cover to build new Jewish settlements. It was not known when talks will resume, but Palestinian officials said that they could begin again as early as Tuesday. They spoke anonymously as they were not authorised to talk to media. Monday’s clashes broke out when Israeli forces entered the Qalandia refugee camp, just outside of Jerusalem, on an overnight arrest raid. Shai Hakimi, a spokesman for the paramilitary border police, said hundreds of Palestinians poured into the streets and hurled firebombs, concrete blocks and rocks at officers. The Israeli military said soldiers rushed to the scene to provide backup and opened fire after they felt their lives were in ‘imminent danger’. An official at a Ramallah hospital confirmed three deaths and more than a dozen wounded. He spoke on condition of anonymity because he was not authorized to talk to the media. Hatim Khatib, whose brother Youssef was arrested in the raid, told The Associated Press that undercover troops dressed in civilian clothes arrived at their home at 4:30 a.m. looking for the brother. ‘After half an hour we started hearing shooting from the soldiers inside our house, and then people started throwing stones at them,’ he said. Youssef was arrested after he returned from morning prayers at 7am, he said. He said he didn’t know why his brother was the only one arrested but said Youssef had spent time in Israeli jail for throwing rocks and was released three years ago. The Israeli military would not say why he was wanted. 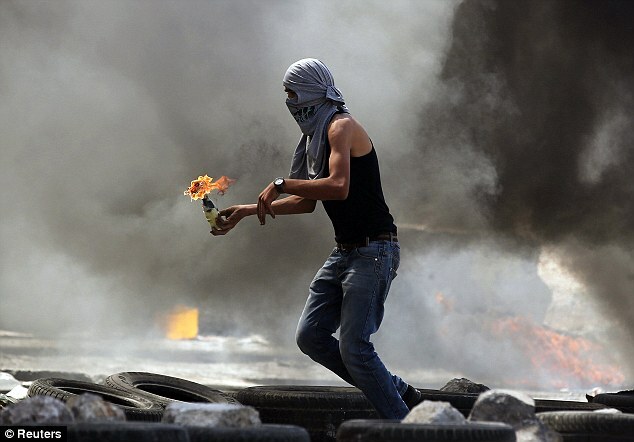 The violence drew fierce Palestinian condemnations. ‘Such a crime proves the need for an urgent and effective international protection for our people,’ Prime Minister Rami Hamdallah said in a statement. Shortly afterward, Palestinian officials said that a planned round of peace talks had been called off. They said the Palestinians were protesting the day’s violence, and were also upset by an Israeli announcement Sunday that it was pushing forward with new settlement construction in east Jerusalem. The Palestinians object to construction in the West Bank and east Jerusalem, the lands they claim along with the Gaza Strip for their future state. Israel captured all three territories in 1967. It was not immediately known when talks would resume. 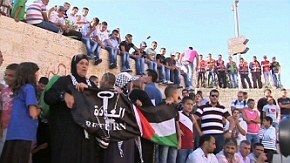 A Palestinian official said the talks have gotten off to a rocky start, with the sides still arguing over the agenda. The Palestinians want discussions to focus on security issues and the border between Israel and a future state of Palestine. 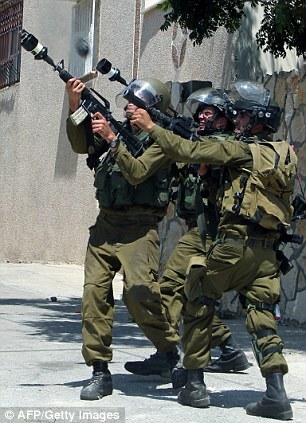 The official said the Israelis have insisted on limiting talks only to security matters. He spoke on condition of anonymity because both sides have promised U.S. Secretary of State John Kerry to keep the details of the negotiations secret. Israeli officials declined to comment. Kerry is expected to meet Israel’s prime minister, Benjamin Netanyahu, in Rome on September 8 to help push negotiations forward, according to Israeli and Palestinian officials.